I like to survey my incoming social media marketing class about their social networks. It is often a learning experience for me: a couple of years ago I learned about two new platforms, Instagram and Pinterest, before they hit a “tipping point” and were in the news. Last January I learned about the popularity of Snapchat and some upcoming sites including Tinder, Whisper and Yik Yak. What ONE social media platform is most important – the one you would keep if you had to have only one? The weighted scores of the seven social media platforms that drew more than 2 mentions from the 60 participants is shown in the following table. The weighted score was created by giving a platform three points for every student that ranked them first in “most used”, 2 points for second and one for third. As you can see Instagram edged out Twitter, followed by Facebook and Snapchat. Have you tried the new extended post feature on LinkedIn? What has been your experience? What are your concerns?? The past three weeks I posted a blog article on LinkedIn. Jeff Bullas, Neal Schaffer and several other people I respect on social media urged experimentation with the new platform. I had had early access for a while, but finally gave it a try when LinkedIn announced that it was available to all. All three posts have been “re-purposed” articles from my two blogs, SMM 4 Business and Service C0-creation. I have been pleased with the metrics on the three. In the following table I compare some basic measures for the original posting on WordPress to the re-posting on LinkedIn. The numbers are very favorable and they are all in addition to the original posting. The numbers for postings two and three on LinkedIn are probably bolstered by the fact that I hired @kikischirr to make illustrations for them. Irritating my most loyal followers by multiple postings. Have YOU tried the new extended post feature on LinkedIn? In my last post on this site, I noted that Content Marketing goes back two centuries. In my two previous careers (only going back to the last century) I was a content marketer and salesperson. In the days before blogs and email I folded newsletters, stamped and licked envelopes to get content to a targeted community of bank and other financial traders. I had also started holding seminars and offered to speak at third-party seminars and conferences. When I went to Asia to run an institutional bond and derivatives sales operation I noted that many local desks divided their brokers into two groups: idea brokers and entertainment brokers. I clearly wanted our desk to be identified as an idea broker as it: (1) fit my personal style, (2) it was more profitable – they paid the same commissions to both, but entertainment brokers had horrendous costs, and (3) I valued my liver and my family. So I stepped up the content activity. Content marketing has been a hot topic in social media and marketing for the past few years. 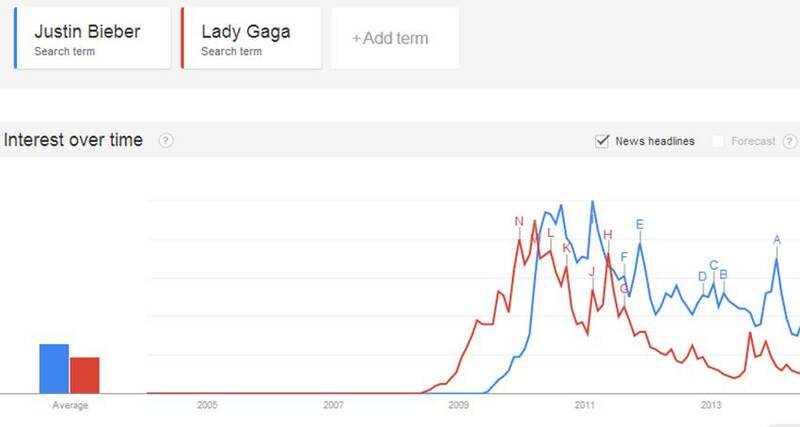 The Google Trends chart shows a dramatic upturn in searches for content marketing since 2011. But if you look carefully at the chart you can also see that there had been a sustained level of searches by that term from before 2004. Actually it goes back much further than 2004. Content marketing is not new: in fact the origin of content marketing is often traced back two centuries. According to an article on the Content Marketing Institute site, content marketing dates to the launch of The Furrow magazine by John Deer & Company in 1895. Other early practitioners of content marketing included Michelin, Jello, P&G and Sears. As I noted in a previous post, I had been teaching marketing and social media marketing for several years before a conversation with and an article by Sander Biehn (@sanderbiehn) led me to the realization that I had been a content marketing and content salesperson in my two careers prior to becoming a professor. In this post I will talk about content marketing and selling in pre-social, even pre-web times. I really enjoy Google Trends – if you haven’t in a while go to the site and check out what is trending. Find out what is hot and predict the future! 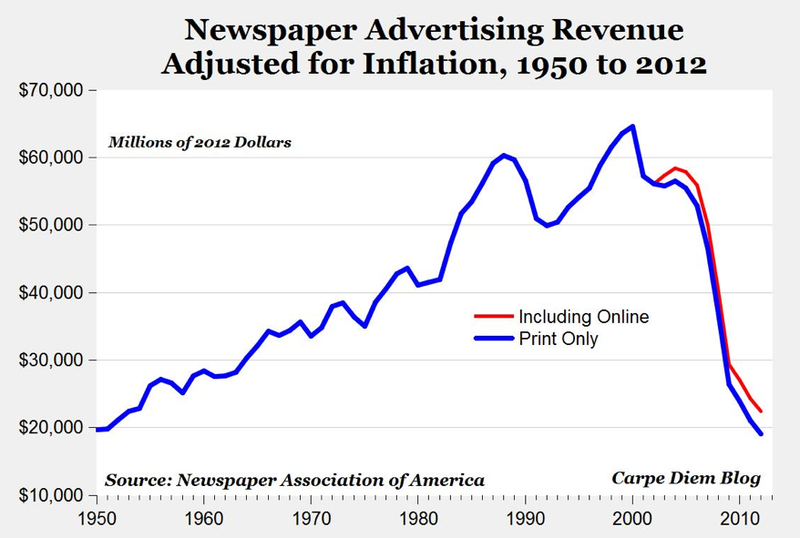 As you can see vividly in this graph, from a peak in 2000 inflation-adjusted ad revenues for newspapers have dropped to 1950s levels. The closings, job losses and service cuts are what you would expect in an industry that has seen revenue decline by 70% in less than 15 years. Native Advertising or Branded Content. These blended approaches also neatly address the pending crisis in content marketing brought about by Content Shock, the overwhelming amount of content available and the Post-Like era of social media, where social platforms make it harder for organizations to reach customers without paying for access. Organizations who can afford it, can use these techniques to reach an audience saturated with content, who are no longer easy to reach out to on social media. There are over 300 million blogs… but don’t worry more are still coming! These are seven new blogs are from my summer SMM course. Why not take a look at one or two that interest you? Encourage a couple eager new bloggers! Getting to Know Israel – The author is a young Israeli women attending an MBA program in Virginia. In her blog she seeks to share what it is like to live and grow up in her home country. Six months to Fluency – Sharing the journey of learning a new language (Norwegian – but the focus is on learning a foreign language). Life with a Lagom orph – Rabbits are wonderful pets. Really! This blog explains why. Top Ten Sporting Moments – The author shares his most enjoyable moments as a sports fan and elicits those of this community’s. Working out Stress – Exercise has many benefits – often overlooked is the management and reduction of stress. A how-to guide to working out stress. BALD HEAD ISLAND WILDLIFE discusses the unique ecosystem and wildlife of Bald Head Island, NC. Save the turtles! Goldsmith Barbeque and Cooking – Smoking and Barbeque VA and NC Style. Smokin! Faith and Hot Coffee – Living an active life with Lyme disease. Please check out a couple that interest you and give a new blogger some feedback! In a post last Tuesday, I noted that the students in my social media marketing classes are a great source of information on new social platforms. For example: Instagram is tops…Keep an eye on Yik Yak, Snapchat and Tinder…Facebook is for baby pictures. Why teach social media marketing? If college students are so well versed on Social Media, why do I firmly believe that every marketing major, every business major and in fact every major would benefit from taking a course in social media marketing?